How do I kick someone in the head? How do I do a flashy kick? How can I get more flexibility to kick high? High roundhouse kicks make for good kodak moments! For all the negative press that high kicks get, there is absolutely nothing wrong with doing a fabulous high roundhouse kick at head level! From my readings, high kicks started being in vogue after the 1960s with a changing of competition rules allowing kicks to the head and no contact to the groin. So it was easy to go for the head with a kick, if you can, and not get nailed in the nads whilst doing so. So kicks started getting higher flashier, and because there were no reproductive repercussions ... the offspring of those early (and brave) kickers also started promoting high kicks. Why shouldn't I do a high kick? They're great! Strategically high kicks are great for sparring. If you do a high kick well, they are fast, they get your head and body away from the opponent, and they can travel through some impossible angles to absolutely nail that target on the head. Get it? (see Hitting Opponents with Invisible Taekwondo Sparring Techniques). So why shouldn't everyone learn a couple of high kicks to add to their arsenal? In my opinion high kicks aren't for everyone - they're a high-risk high-yield move. Most average people don't have enough fast twitch reflexes, hip/leg flexibility, nor combat experience to pull off high kicks. The worst thing too is that it could be too easy to adapt a simple basic kick to aim higher even without the combative experience to deal with the consequences of missing the target. The long range roundhouse done at head height requires you to torque around your hip as a fulcrum. Traditional stylists would prefer to keep their weight firmly under their hips and do short range kicks and retain their ability to counter strike. High kicks require you to raise your center of gravity somewhat, tilt the hip, lean back and swing the leg forward. Where traditional stylists doing short range roundhouse kicks have a support foot that's more or less perpendicular to the target, the long range or high roundhouse requires your support foot to turn away from the target in order for you to allow your hips to have freedom to rotate with the kick. The movement of the body backwards and in the opposite circumfrential direction helps bring the kicking leg forward in a fairly powerful motion. Where traditional stylists would rely on kime or focus to generate power, this whole body muscle tension to send body weight bearing on the impact surface is absent from the high kick -- relaxation is much more important as the power is generated by the speed of the swing. But yes, if it sounds like some crazy balancing office toy, you're right! You are required to maintain balance on your support foot whilst you're accelerating both your leg and body around your hip. 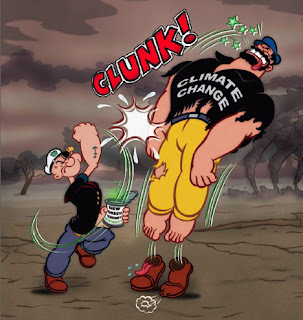 See video Power Generation in Roundhouse Kick. I don't want to get your hopes up. But you don't have to do a full split to kick at head high. But of course, if you need to kick an experience opponent head high, you need to come close to full split in order to cover the right distance and raise the kick sufficiently to reach at least his jaw. At this outer limit of your range of motion however I can tell you right now ... this WILL WREAK HAVOC WITH YOUR JOINTS WHEN YOU GET OLDER. So train and use these types of kicks sparringly. Now to raise the kick all you have to do is to raise your knee! Relax your hips, and push them forward with your support leg. You have to lean backwards somewhat to accomodate the change in COG. For more exercises to strengthen the legs for a high kick, check out MarksTraining.com: Superfoot Training for high kicks and the video he posted by Bill Superfoot Wallace. 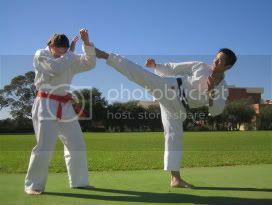 Lots of beginners don't understand the high kick and think it is a baseball bat swung at the opponent. This works well for pitting the kick against a power bag or striking mitt. But against a human opponent who is intent on blocking or deflecting your strikes, the kicker needs to have enough understanding of angles of entry and distances in order for him to unhinge the knee and the ankle so that the kick does not get stopped by his coverage. The foot is sent 'through' the arms and gets 'injected' into an appropriate strike zone for maximum impact. What this means is that the leg is not held fully extended or unchanging. The bend in the knee and the ankle allows the ball of the foot to strike the opponent. (see Training Aids that Wreck Combat Skills). If you are blessed to have fast twitch muscles, speed, reflexes, flexibility, and some brains consider this -- a person who is going to high kick you in the head will also probably be expecting you to high kick him in the head. So don't. A person who won't high kick you in the head will probably not expect you to high kick him in the head so you could probably *try*. HOWEVER, that same person would be more willing to knock you out with a punch so if you miss that &%(#$@* kick, you're toast! The next idea is this - the front kick moves quite quickly. It's like a jab. If you can kick a high kick with the front leg, that's all you need, though mostly it'll probably be a tactical move and may not land with much power. The back leg however travels farther, takes a whole lot longer and therefore needs you to feint or distract the opponent before using the back leg to exploit loopholes in his defence. Who is the best person to kick in the head? The person most likely to not deal well with the high kick is that person who doesn't have much combat experience, who doesn't do high kicks, and who is a little more reactive and defensive ... basically unlikely to do a blitz attack on you at any opportunity. For all others, you might consider aiming a little lower - like in their groin! Have I mentioned that before? All you people out there who spar and fight with no consideration of your privates ... let me tell you right now there are a good deal of fighters who go for the groin often. Your nuts can be access with any kick irrespective of whether you have your leg up or if you are side-facing. THis is also irrespective of the height of your kick! So my advice to anyone is to learn how to drop your hand (palm heel, palm or blade of hand) in front of your nads to protect yourself from being shut closed like a book. So back to my 80/20 rule. If you don't fall easily into that 20% range, you'd probably know it by now and this would indicate you should stay well clear of high kicks. If you however have some natural ability and can do a high kick nicely, you should also reconsider the amount of talent you really should have before using it often as a combative tool. Work on your basics first, won't you? Get some exposure then do some experimentation. Don't get too excited with it. Interested in Acquiring Roundhouse Kicking Power? Any of the high kicks are good for catching a person's blind spot. It all depends on how their head is angled. My high round is mediocre and I would not try it unless I had an obvious opening. However, I do have a fast and powerful inside crescent that's great for tapping blind spots. Despite their risk I think it's not a bad thing if you can add at least one good high kick to your bag of tricks. Something I hear over and over at my kung fu school which is applicable to any art: Most street fighters are not expecting to get into a tussle with a martial artist. So, while most of us know counters or weak spots to a given technique, they might not. I have often heard to use hands above the waist and feet below the waist. In regards to roundhouse kicks to the head, I am one of the 80% that should be doing 20% of the kicks. I may not able to do a high roundhouse kick but I can do front kicks to the chin (the front kick in Okinawa Kenpo kata). I miss kicking high, I'm currently working on all that flexibility I've lost. It's amazing what a year of taking care of one knee will do for flexibility! You seem to love roundhouse kicks. The last time you resurfaced was when we did those videos of roundhouse kicks, remember? When I entered the army at 18yo, I notice after about 2 months in I had lost a great deal of flexibility. From full split I was surprised to be hovering about a foot off the ground! Even now if I don't train for a couple of weeks I would lose about 4-7 inches. It'll take a week or two to comfortably return to almost full split. That would be "noticed" rather than "notice". Many thanks for the link to my article. I think the High Kick is definitly something that not all should attempt as you say. However I do think all should try practising them in training as they build leg and body strength which can be then applied to other techniques. Great Post! Colin, Many thanks for the links. I have to say that lately I seem to be running into more and more stories of well know martial artists having knees nd hips replaced. I guess if you push your body to extremes too often for two long stuff can wear out. This should be required reading for beginners, intermediate & advance students. My number one rule is NEVER sacrifice technique for height. Back in my sparring days I loved knocking people out with a well placed roundhouse right behind the jaw. Those were the days! I tore my ACL and had it repaired in 2001. Was it from kicking? No! It was from forms! I wasn't even doing the form hard - I was teaching the form! I am the third black belt I know that has torn their ACL doing #19 in Choong Moo form. Most people don't get there anyway. Or they learn pretty quickly it's not doable past a certain height. Or they just save it for the camera. Those are the lucky ones. Other unlucky bastards feel that height is IMPORTANT for their effectiveness. Those are the misguided ones who might get themselves in trouble. I hear you brother! I can still do things like that fairly easily - but I save them for students shorter than myself!!! Hahahahaha. I have had hip joint inflammation over several years and thought it was my back. This was certainly directly linked to very high kicks - done at the edge of my range of motion. This has made me greatly reduce high kicking as a personal exercise, but I do still include such training for my student body. Forms are tough. You're forced to do something in a specific way. And your body is stretched to do it hard. Kicks are mostly simple movements with a good deal of relaxation. OOOooooooh. GOOD TIP. I've never had any problems with that jump, but I guess it only takes one tear! Hope your ACL gets better. This is an excellent blog, very impressive. Lots of useful information. I look forward to reading and learning from the many articles posted here. In the Silla Kingdom Era they had a festival every year for this kicking game. What was the kicking game called? It is suppose to be played with a goal and it was said to be the root of the Hawrang fighting technique?